CRYPTO 2012 was the 32nd International Cryptology Conference. It was held at the University of California, Santa Barbara (UCSB) from August 19 to 23, 2012. The academic program covers a broad spectrum of topics in cryptology. The conference was sponsored by the International Association for Cryptologic Research (IACR), in cooperation with the Computer Science Department of UCSB. Conference proceedings, both electronic and paper versions, were published by Springer. - 9/28/12: Videos and slides of the conference presentations are now online. 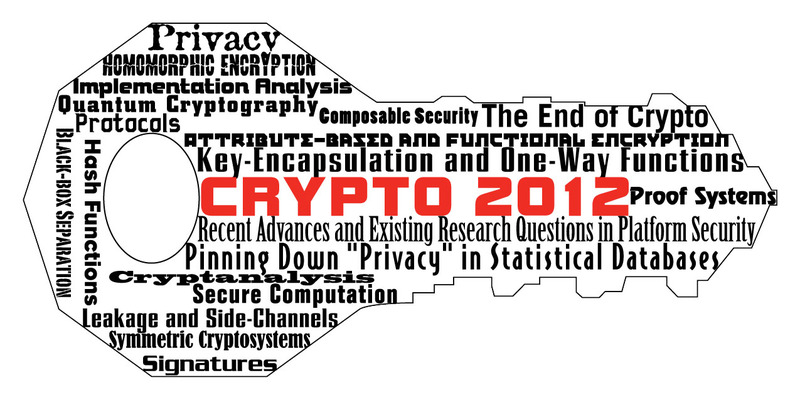 - 8/15/12: CRYPTO 2012 has created a conference logo! - 7/11/12: GREAT NEWS: We will award a second round of stipends to student attendees! Application deadline: July 27th, 2012. - 6/29/12: Paper abstracts have been linked to the program page. - 6/28/12: Rump Session is now accepting submissions. - 6/18/12: Information about invited talks and tutorial has been posted. - 6/13/12: Preliminary program information is now available. - 6/3/12: CRYPTO 2012 has created a Facebook page. - 6/2/12: List of accepted papers has been posted. - 5/21/12: Online registration is now open.